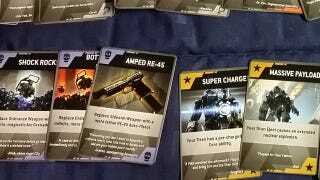 Redditor FPSAutopsy took on the job of making the magical cards that bestow bonuses on Titanfall pilots when burned into reality. No word on if they have the same effect when not in-game. They are printed on 2.5in x 3.5in 300gsm card stock. There are 54 of them that come in the pack with 1 of each card in the game and 2 of each titan. Currently I am trying to get some higher quality photos for the prints as some of them are kind of low quality. Quite a few people have expressed interest in buying them but at the moment I have sent a few tweet and emails to respawn so that I can get a few decks out to people who really want them.